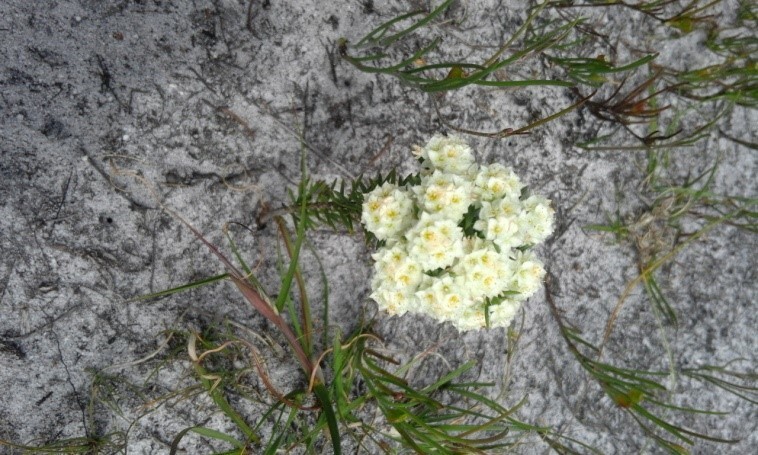 It had been months in the making – a combined walk, bringing together members of the Kirstenbosch Branch and the Kogelberg Branch of the Botanical Society, and it didn’t disappoint. 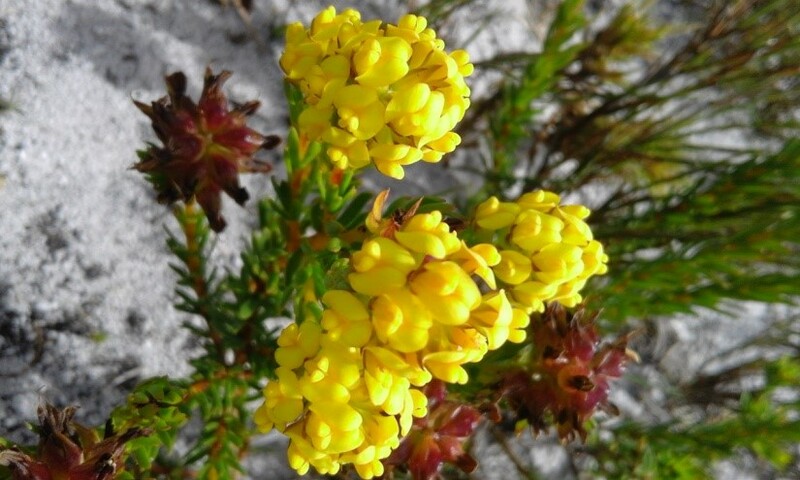 When you have upward of twenty-two eager fynbos junkies making their way through the Brodie Link part of the Hangklip Nature Reserve two things immediately become apparent, you move more slowly and you see more flowers. Aided by such botanical legends as Ivor Jardine and Corinne Merry, we could be sure of a fascinating morning. A bewildering variety of Aspalathus, Cyclopia, Diastella, Serruria, Erica, Leucospermum (including the exquisite sprawling L. prostratum in full flower), Lachnea, fragrant Agathosma, Gladiolus, Mairia, Erepsia, Wachendorfia paniculata, the endemic Hangklip form of Saltera sarcocolla and many more had us scratching our heads and flipping through flower guides. Plant identification requires a keen eye for fine detail. Starting at the Stream Road entrance to the Hangklip Nature Reserve in Pringle Bay, we headed east up the trail towards the memorial plaques commemorating the two astonishingly generous gifts of the land which makes up the Hangklip Nature Reserve. Simon Marais and the family of Bernard Brodie, facilitated by Allan Heydorn, bought and donated the land to the WWF-South Africa some years before, ensuring that it would be conserved in perpetuity, under the management of Cape Nature as part of the Kogelberg Nature Reserve and the core zone of the Kogelberg Biosphere Reserve. A refreshment break at the highpoint above Pringle Bay, with a wraparound view of mountains, sea and the villages of Rooiels, Pringle Bay and Betty’s Bay far below, provided for much chatting – and proof that the fellowship of the flowers makes for good friendships, some old and many new. 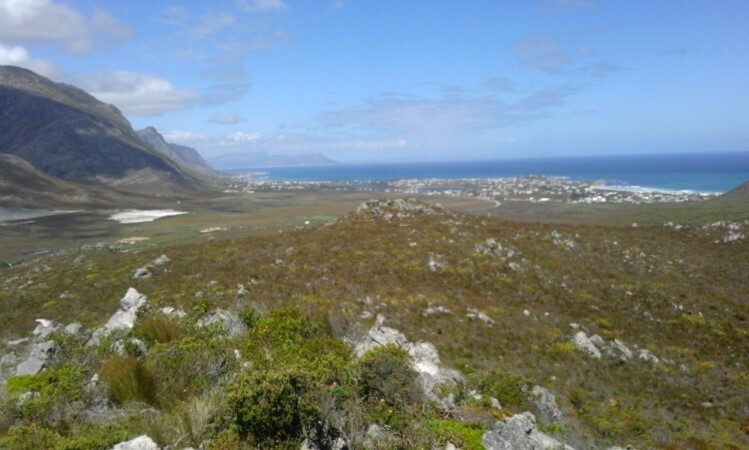 A view of Betty’s Bay from the high point above Pringle Bay. It didn’t escape us that this combined walk and the camaraderie it brought was a fitting way to mark a new beginning for the Botanical Society of South Africa after the happy resolution of the controversies that had wracked the Society over the previous two years. The adoption of new twin constitutions for the national Botanical Society and the Branches of the Botanical Society at the Special General Meeting a few weeks before opens the way for vibrant and creative branch activities – and this looked like a good start. It was especially good to have Marinda Nel, the new Chairman of the Botanical Society Interim Council, along for the walk. We wish her everything of the best as the Interim Council charts the way forward for Botsoc throughout South Africa.